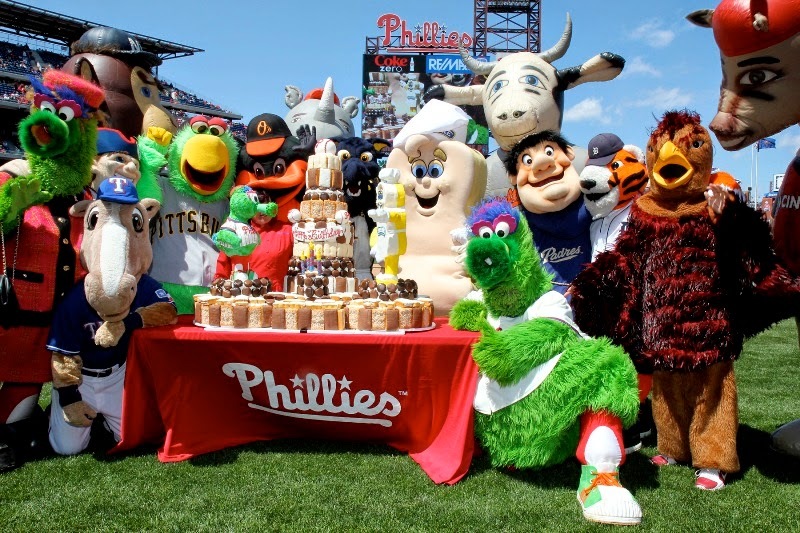 Philadelphia, PA -- The guys in pinstripes weren't going to make a fool out of the Phanatic's 37th birthday. Ben Revere drove in the go-ahead run with a triple in the fifth inning and the Philadelphia Phillies held on for a 5-4 win over the Atlanta Braves in Sunday's series finale at Citizens Bank Park. Ryan Howard hit a three-run homer for the Phillies, who won two of three against the Braves. Jerome Williams (2-1) gave up three runs on eight hits before being removed with two outs in the seventh. Jace Peterson had a two-run single and Freddie Freeman doubled twice for Atlanta. Trevor Cahill (0-3) allowed four runs on five hits and walked three in six innings. Freddy Galvis, who had three of Philadelphia's six hits, scored on a throwing error by the first baseman Freeman in the seventh to make it 5-3. The Braves threatened in the ninth against Jonathan Papelbon, who gave up a home run to pinch-hitter Alberto Callaspo with one out. After Nick Markakis struck out, Andrelton Simmons singled and Freeman walked. Papelbon survived the shaky outing and earned his fourth save of the season when Revere caught a fly ball hit by Kelly Johnson in front of the left-field wall. "We came up a little short. That add-on run in the seventh, that hurt a little bit," said Braves manager Fredi Gonzalez. Two walks hurt Williams in the first as both runners scored when Peterson hit a two-out single with the bases loaded through the right side of the infield. The Phillies grabbed the lead in the bottom of the inning on Howard's two-out blast to right-center field. Revere was aboard with a leadoff single and Chase Utley worked walk before the homer. "It was good for us to be able to come right back after they got those two (runs)," Howard said. Atlanta tied it in the third on back-to-back doubles by Freeman and Johnson. Revere tripled into the right-field corner in the fifth, plating Galvis for a 4-3 Philadelphia lead. Notes: The Phillies claimed their first home series against the Braves since a three- game sweep from Sept. 6-8, 2013 ... Philadelphia had lost its last seven Sunday games dating back to last season ... The Phanatic has been voted one of MLB'sbest mascots since his April, 1978 introduction, and has been played by Tom Burgoyne since 1993. The Phanatic presents the first in what aims to a be a series of posts which aims to look at potential Flyers head coaching candidates from the perspective of writers in these candidates' home cities. This week, it's Petshark, who covers the San Jose Sharks, offering perspective on the newly-freed Todd MacLellan for Philadelphians wondering if he can do the job here. Hiring an NHL coach is more fun than firing one, but finding the right one from those available is tricky business. Promoting from within seems like the safer bet, since that coach will not have to learn how the organization works and what is expected. Then again, when the team has struggled for several seasons in a row, you need to consider changing those expectations. If Flyers GM Ron Hextall is willing to do that -- and it appears that he must after the roller coaster tenure of Craig Berube -- he could be looking for an experienced man like Todd McLellan. Are the Sharks on the verge of a meltdown similar to what the Flyers have gone through over the last two seasons? I don’t think so, but if they are, only a small part of the blame lay at McLellan's feet. That is why it is assumed that McLellan will have his pick of coaching positions after he agreed to part ways with San Jose earlier this week. 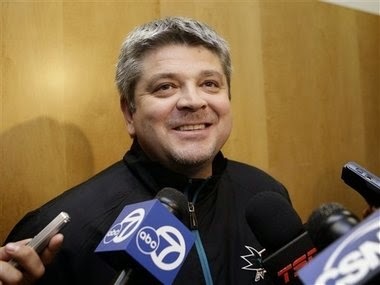 McLellan’s time with the Sharks -- a full seven seasons -- was not perfect, but on balance he worked well with his players and got a lot out of them. If the Sharks stopped hearing his message, it was not because they doubted its value. Rather, too many messages were coming from too many sources. Perhaps the disconnect was that management, coaching, and players did not agree on what this team was. Doug Wilson, San Jose's embattled GM, said it was time for a rebuild, then said he still expected the team to make the playoffs. He said he wanted a younger, faster team, then he signed John Scott. The coach was saying that the team lacked an understanding of their identity, a month and a half into the season. The players said they could beat anyone… and then too often failed to do so. The team’s collapse was not inevitable, but it did not happen suddenly or in February. “There’s often some pain,” Wilson said of how he had expected his rebuild of the Sharks to go. Whether or not that was spelled out last summer, it seems to have been the only message that got through to every level of the organization. Pain is not much of a message. How to avoid or minimize that pain needs to be explained or the result will be paralysis. We will probably never know all the specifics of the disagreements between McLellan and the front office, but it is pretty clear that management, coaches and players were not all pulling in the same direction. McLellan should not be held responsible for a failure to correct the team’s problems this season, last season, or in seasons before that. He played a part, but he did not create all of the problems he could not solve. It was McLellan’s idea to have Brent Burns play as a forward while coming back from injury. 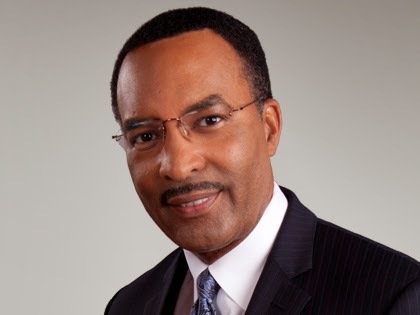 It appeared to be Wilson’s decision to have him move back to defense. Whether he thought it was a good idea or not, McLellan used Burns on the blue line, though it left the team short on scoring up front. McLellan showed a tendency to give ice time in a way that was not always based on merit. Veterans tended to squeeze out the younger players, a pattern not unique to the Sharks. Maybe this was the way to go, as there is little time to train rookies during a playoff run. McLellan’s Sharks were always in a playoff run so the logic is sound. Still, players like Nic Wallin, Kent Huskins, Colin White, and Scott Hannan were not doing such a bang up job that a younger candidate did not deserve a good long look. If McLellan ends up in Philly, he will have to adjust his philosophy and integrate youth into the lineup, since one of Hextall's priorities is development in the minors and there are a half-dozen players who could be ready within one or two years to make the NHL. McLellan perhaps gave players too much credit for being self-motivated, the flip side of knowing that veterans and stars are unlikely to respond well to bludgeoning, verbal or other. He often said that the team needed to find motivation from within. This is true, but frustrating to watch when they can’t find it. I’ve never been the type of person to say a coach needs to get… to change. I think that’s a cop out most of the time, when you blame a coaching staff or a coach. They don’t go out on the ice and play the game. Maybe it’s the players that need to… something needs to happen, maybe that’s what needs to happen. I mean, because we’re supposed to go out there and win hockey games. Like I said, a lot of guys didn’t have good years. A lot of guys weren’t consistent and that’s why we didn’t win. What Couture said is true: even if the Sharks players were united to start this season, they were pretty much in a shambles at the end. Couture probably does not give coaches enough credit if he thinks they can’t fix those problems, if he doesn’t think that is the coaching job description. Would a different coach have prevented this unraveling? Would better locker room leadership have fixed it? Would more faith and consistency from management have avoided it? We won't find out. There are no do-overs. Would McLellan fix what ails the Flyers? Not all of it, that is not in the job description. Balancing what the players want with what the team needs is the primary motivation. Todd McLellan can do that, and with an organization like the Orange and Black which stresses harmony in decision making through the ranks, it seems he'll get a better shake. Philadelphia, PA -- Martin Prado finished with three hits and four RBI, while David Phelps turned in seven scoreless innings to lead the Miami Marlins to an 9-1 win over the Philadelphia Phillies in Thursday's rubber match of a three-game series. Phelps (1-0) was making his second start in place of the injured Henderson Alvarez. He struck out five and yielded just three hits and two walks over his 95-pitch appearance. The Marlins, who won the final two in the set to erase a five-game skid, scored four runs in both the fourth and sixth innings. Adeiny Hechavarria exploded for four hits, drove in three runs and scored twice, while Giancarlo Stanton hit his fourth home run of the season. Philadelphia gave the ball to reliever Dustin McGowan (1-1) after Sean O'Sullivan was placed on the disabled list, and he struggled in his first start since May 14, 2014 with Toronto. He was charged with four runs on three hits and four walks in just 3 1/3 frames. With two more gaffes this afternoon, Ryne Sandberg's club surpassed the Nationals for top spot in the National League in most errors committed. McGowan threw a 1-2-3 third inning and appeared to be settling in, so the Phils tried to stretch him through another inning. He instead issued walks to Michael Morse, Marcell Ozuna and Jarrod Saltalamacchia to load the bases, and Hechavarria started the scoring with a two-run single to end McGowan's day. Hector Neris, making his first appearance of 2015, promptly hit Phelps to reload the bases and Prado drove in two with a two-out single. A day after committing three errors and allowing five unearned runs, the Phillies' defense made another key mistake. With one out in the sixth and Hechavarria on second, shortstop Andres Blanco's throw to retire Dee Gordon at first was in the dirt and Darin Ruf could not scoop it. Prado followed with a two-run double, and Stanton lined a two-run homer just over the wall in left field to extend Miami's lead to 8-0. The Marlins tacked on an insurance run in the ninth on another single by Hechavarria, and Cesar Hernandez's sacrifice fly in the bottom portion got the Phillies on the board. the Phillies hosting Atlanta for three and Miami welcoming Washington for three. The Lehigh Valley Phantoms completed their first year in Allentown and the Flyers' primary affiliate notched its 19th overall campaign ranking fourth in the American Hockey League with an average attendance of 8,163 and saw more than 310,000 fans pass through the turnstiles of the PPL Center. That's almost double what the hockey-bred citizens of Glens Falls could amass, though the Civic Center was nearly filled to capacity on most nights over five seasons in a smaller venue. A reduction in distance from 280 miles down to 60 miles made for an easier evaluation and recall process between the parent club and their farm team. But so what? The organization failed to produce a collection of prospect who demonstrated the most obvious marker of success -- a postseason berth -- for the sixth consecutive season. There's an inexact science present in the AHL of the 21st Century, a clear emphasis on development and curation rather than focusing on its reckless, entertaining product as a way-station for marginal talents to do anything it takes to make it up the chain. Nonetheless 30 NHL teams provide singular matches with their affiliates, and there is a degree of uncertainty on how each affiliate's performance is a reflection or rejection of how its parent conducts business. That's how head coach Terry Murray can, with a straight face and facts to back it up, call this season a success. Eleven different players who spent a majority of the season at the AHL level earned recalls to the Philadelphia Flyers at some point, and for various lengths of time. Though only one -- Scott Laughton -- managed to stick in the long term, there were enough transactions with the NHL to justify the development side of the equation. Offense: In spite of additions like Andrew Gordon and Kevin Goumas, and seeing eight players finish in double digits, the Phantoms ended the year with 194 goals in 76 games (2.55 per contest). That's only good enough for 12th in the Eastern Conference and 25th overall in the league. Included in that total are six shutouts against, and back-to-back blankings against the Baby Pens on April 4-8. Out of 76 games, even factoring in the two-month absence of Scott Laughton, the late-season call-up of Nick Cousins and the struggles of Goumas, Petr Straka and Taylor Leier to break through, scoring two or fewer goals on 41 occasions doesn't pass muster. Cousins missed 16 games and still finished atop the goal list at 23, while Jason Akeson had 23 in 57 games. Gordon contributed 18 while Straka (14) finished with one more than Zack Stortini in eight fewer appearances. Their season-best output was just six goals, done twice, and both on the road. It was a marginal step up from the previous season, when five was the limit, and matched the ceiling from two years back in Murray's first year as coach. No Phantoms team in three years has broken the 200-goal mark overall. Tertiary scoring was hampered by Chris VandeVelde's permanent spot in Philly, as well as Blair Jones' health issues and Ryan White's off-season training injuries which took months to heal. Those names absent from the lineup are also reasons why play in the defensive zone was lacking to some extent. Defense: A fresh infusion of defensive talent, minus their biggest prospect in Shayne Gostisbehere for most of the season, couldn't prevent a bottom-third finish in preventing offense. LV surrendered 237 goals in 76 games (3.12 per contest), 13th in the East and 24th in the league, yielding three or more scores on 49 occasions. Take it for what you will, but Oliver Lauridsen was the only steady defenseman on the club who finished with a positive plus-minus (+6) in significant minutes as second-pair anchor. Brandon Manning showed enough offensive upside and overall growth to gain praise from Murray, and ended up with the most points of any player on the blueline but also finished minus-13. Adam Comrie, who split the year in Reading, compiled a team-worst minus-21 in 40 games despite 18 points. There are a ton of mulligans, however, for a team stacked with defensemen solely for the purpose of separating the quick and the dead: Gostisbehere was out since early November; Mark Alt was constantly beset by injury and skated in only 44 contests; Manning, the club's lone all-star sat out 16 times for recalls and various maladies, with Steven Delisle, Robert Hagg, Jesper Pettersson all firmly in the "project" stage. "If I'm a young defenseman like Robert Hagg and I know Kjell Samuelsson, our development guy is there, I'm picking his brain," Hextall said. "It's a big thing for a club to express interest, but also to invest resources like this shows how important it is to us." After two years of not focusing on development and one year of a renewed focus on development, the Phantoms' goal differential moved from minus-36 to minus-43 and minus-43 again. Goaltending: Medals of Honor should be awarded to both starter Rob Zepp, backup Anthony Stolarz and special mention to ECHL call-up Martin Ouellette. Zepp faced at least 30 shots on goal an astounding 34 times just in the minors and still wound up with respectable numbers (21-20-1, 2.68 GAA, .917 save percentage) given the workload. Flyers' 2012 draftee Anthony Stolarz is getting a snoot-full of the vagaries of the pros, having picked up the club's only two shutouts but going 9-13-2 with a 3.28 GAA and .905 save pct. after such success in London of the OHL. Based on a limited sample size in thr NHL plus cost effectiveness, Zepp is a favorite to be elevated to the backup job in the Delaware Valley next season, but leaving Stolarz to be a starter or rolling the dice again and trying to find a Zepp-like free agent is too much of a gamble. Special Teams: A power play which featured Stortini and Brett Hextall causing trouble atop the opposing crease operated at a 15.6 percent efficiency (53-for-339, 20th overall) and allowed nine short-handed goals -- a sharp contrast with the Orange and Black. Their penalty killers worked two slots lower, preventing goals just 81.6 percent of the time (65-of-364), perhaps an eerie foreshadowing of what awaits a Flyers' penalty kill that was scraping the bottom of the franchise worsts. Intangibles: For an organization desperately trying to break with the past, the kind and number of penalties taken by the Phantoms is totally unacceptable. An AHL-high 1,834 PIMs was 108 more than their closest competitor (Bridgeport, NYI) and well more than double the least-penalized club (Worcester, SJS, 809) in each conference (Grand Rapids, DET, 869). Cutting out Stortini and Jay Rosehill in favor of more serviceable talents excises almost 400 minutes from that total, but the rest is up to coaching and each player's internal sense of discipline. If Murray and Cote possess something else in the arsenal to impress that upon the team, they'd better use it. It's an intriguing fact the Phantoms were only shorthanded 25 more times than placed on the advantage, which might suggest at a small level the renegade spirit still buried within the AHL rather than any failure of Murray or Cote to rein in their charges. 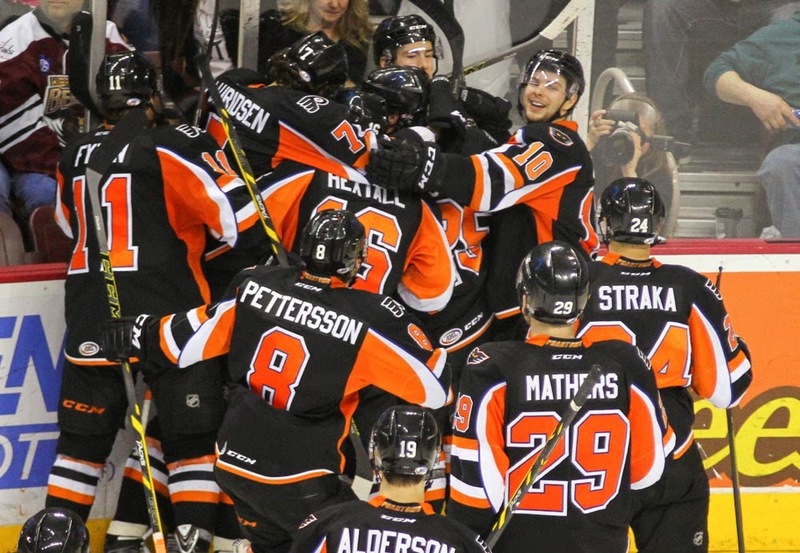 The Phantoms went beyond regulation 22 times overall and finished 7-1 in shootouts. While it's a built-in part of professional hockey games, participating in the equivalent of an extra two-plus games is a double-edged sword which tests stamina but indicates a lack of finish. An enthusiastic crowd in a new destination greeted the Phantoms 38 times, with 26 sell-outs and the home team responded with a 17-15-6 record and a ton of extra hockey for the dollar. The operation was miles ahead of the no-frills approach the Brookses embraced in Glens Falls, and there's no off-ice reason fans shouldn't show up in droves again next year. off-season workout plan, and will use every bit of new technology and the facilities available within the PPL Center to help whomever will be retained for next year get a good start once training camp begins. He mentioned in Sunday's post-game that the Players' Association is the biggest hindrance to development overall, and for good reason. With the punishing six-month schedule, playoffs notwithstanding, and the multiple 3-in-3's at the AHL level, a player needs down time right at the start to rest and recover. To expect a prospect to continue his development through constant competition stands an excellent chance of wearing out that prospect by the time September rolls around. However, Murray did lament the fact that, like baseball's Arizona instructional or Caribbean leagues, there's no "summer hockey" leagues for late-comers to hone their skills -- with the possible exception of the Worlds which take place in May and are generally only open to North American players whose clubs are not participating in any postseason. That structure and rules in place with the current CBA means players like Danick Martel, Nick Luukko and Cole Bardreau are stuck with months of off-ice training after a too-brief taste of the professional ranks. One promising sign lay in the off-ice rehabilitation of Gostisbehere, who was briefly the center of a communication controversy between Murray and Flyers GM Ron Hextall. Recovery from that knee injury has forced the 22-year-old Union College product to alter his fitness program, but for the better, since he was a noticeably slight presence in close quarters. "In the big picture, when you look back 10 years from now, you might say Gostisbehere's injury was a real positive in the sense he became a player who really paid attention to the off-ice part of it and became a bigger, stronger player," Murray said Tuesday to the Inquirer. "I think he's put on almost 20 pounds of good, solid weight and that's going to help him be ready at training camp." Both Cousins and Laughton drew praise for their time spent in the Flying P, so it's not unreasonable to expect they'd be the first to either snag a roster spot in camp or the first to head down the Northeast Extension when needed. If and when that day comes, Hextall will be hard pressed to find replacements, but that's an unsung part of his job as GM -- stocking the minors with durable, productive players who might need to play there for several seasons through the draft or free agency. Drafting/signing in the short terms should look to bolster the forward ranks as it previously needed to fill up the backlines. Outlook: Terry Murray has been the head coach of this affiliate for three seasons. In that time, he's had three separate and distinct rosters in New York and Pennsylvania, but each year the ebb and flow has been obvious: whenever the club fastens down defensively, they go on a run, usually in mid-season, which pushes them towards hope of a playoff berth. It comes with a dearth of offense, however. Some time after that run, the luck turns sour and an extended winless streak/losing jag occurs which knocks the team out of contention. Offense ebbs and flows, but more pucks are present in their own net than the opposition. Murray made no secret on Sunday of his desire to return to the NHL. He hasn't been there since 2011 with Los Angeles and has put on a brave face moving with the Phantoms. But he's going to be 65 in July, and while the passion to return is evident, he also made no mistake in relating that the head coaching job, at least, at both levels, is labor intensive and pressure packed, with an unbalanced schedule causing additional pressures in the AHL. That Inquirer piece from yesterday revealed Murray wants a crack at an assistant position with the Flyers under the new regime. That might be more his speed, and he's done his part in interviews to tout the players the Flyers wanted to bring up, but it would create an opening Hextall would have to do some extra work in order to fill. The Phantoms' single assistant coach, Riley Cote, might suffer from the same issues that Craig Berube did in Philadelphia. Although he's played the good soldier, Berube may not take kindly to another demotion, and since the improvement of so many potential future Flyers will be at stake, better choices beyond the organization must be considered. "Obviously making the playoffs is something we set out to do and would have liked to do," Hextall mentioned over the weekend. "I'm happy with the way things have gone for the most part. At that [AHL] level, you get hit by two teams' injuries, which is tough. Overall, we've had some young players, some prospects, playing in some pretty critical roles. … A lot of the kids are on the power play, the penalty kill. You want the kids to evolve by playing in big roles." Regardless of who's pulling the strings, health and discipline along with the skill and ability of those who spend an entire year in Allentown are the major factors to the Phantoms' on-ice success going forward. That's why its crucial for Michael Parks to be signed, and for Bardreau, Martel and Luukko to prove themselves worthy right up front. They will be counted on to fill the gaps the call-ups leave. Hextall also needs to fill the gaps of others like Darroll Powe and Ryan White, who may also be moving on, with steady AHLers not under the microscope. In the back half of the season, even as the team's broadcaster crowed about the home attendance figures, once it became apparent the Phantoms were out of the playoff picture, there were incrementally more gray-backed seats visible around the arena. On one hand, it's promising for the Flyers that so many Phantoms gained recognition and feedback and as a result, there are a handful of players who could join the NHL club over the next several seasons. On the other, the Lehigh Valley is not as dedicated to or intertwined with hockey at any level compared to Philadelphia or upstate New York, and it's unlikely that unless there are playoff berths coming with prospect development, fans will continue to support the team in the same fervent manner. PHILADELPHIA - From a pure football sense, Tim Tebow's arrival in Philadelphia means virtually nothing. The best-case scenario is that everyone's favorite mechanical mess at the quarterback position turns into a third-string option and a valuable specialist in a system that should play to his perceived strengths. At worst, it's a misguided distraction serving as a favor to Urban Meyer in at attempt to keep Tebow's name relevant in NFL circles. Off the field, however, it's an emperor-has-no-clothes moment for Chip Kelly. Like many of you, I have no idea what Kelly is doing in Philadelphia these days, but the one thing that has become abundantly clear is that his reputation as a great football coach is a bit overblown. Meanwhile, his prominence as a personnel man remains uncharted, but it's pointing toward schizophrenic. None of that means Kelly is doomed to failure in the City of Brotherly Love, it just foreshadows that he will ultimately be measured against names like Ray Rhodes, Rich Kotite and Buddy Ryan, not transcendent monikers like Belichick, Shula, Lombardi and Noll. My definition of a great football coach is pretty simple. It's a teacher who has a philosophy but understands his job is to accentuate the strengths of the players on hand while masking as many deficiencies as possible. Kelly did that pretty well during his first two seasons in Philadelphia with what was essentially another man's team (Andy Reid). 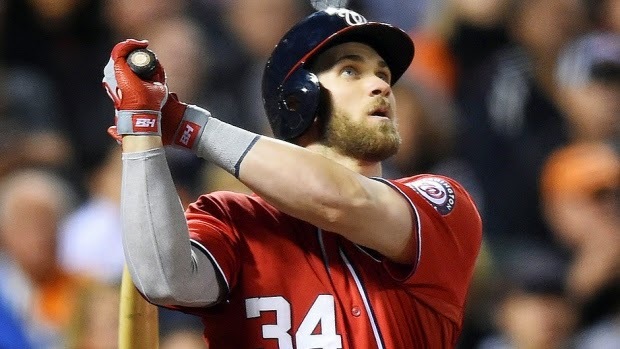 Instead of building on that, however, he decided to double down on the system, a muddled coagulation of offensive tempo, coupled with an overhyped "sports science" approach off the field based on common sense practices like eating well and getting plenty of sleep. Despite winning 20 games with talent that didn't "fit" what is at its core an extremely simple offensive philosophy based on that tempo at the expense of Xs and Os, Chip's assessment seems to be that he had gone as far as he could go with what he believed were square pegs. So he won a power struggle with ex-general manager Howie Roseman, got personnel control and started in on a series of roster moves that can kindly be described as inconsistent. To date, Kelly has traded Pro Bowl running back LeSean McCoy and starting quarterback Nick Foles, released offensive guard Todd Herremans, cornerback Cary Williams and edge rusher Trent Cole, and let 1,300-yard receiver Jeremy Maclin walk in free agency. In turn, he's brought back potential new leaders for his offense and defense, quarterback Sam Bradford and inside linebacker Kiko Alonso, signed a better running back than McCoy in DeMarco Murray, got Murray a really good caddy in Ryan Mathews, upgraded the cornerback position with two junior members of the Seahawks' "Legion of Boom," Byron Maxwell and Walter Thurmond, signed an aging receiver in Miles Austin, and now brought in the biggest distraction he could. The departure of significant, high-powered skill-position talent since Kelly arrived, namely DeSean Jackson, along with McCoy and Maclin, is especially troubling with some questioning the coach's ability to handle "big" personalities and others unfairly pointing at some kind of racial animus. From a psychological standpoint, Kelly seems conflicted from day to day with no real long-term plan. He is more often than not a walking-talking contradiction. Today, one of his quips might be "the best ability is availability" and tomorrow he'll say Bradford's consecutive season-ending ACL tears are no big deal, and Mathews encyclopedic history of maladies are nothing to fret about. Next week, he may break out "big guys beat up little guys" to explain his disdain of a Jackson or even a Maclin, all the while praising the vaunted playmaking skills of the 5-foot-6 Darren Sproles. He'll gush ad nauseam about a flawed prospect like Marcus Mariota even though his entire offensive system is supposedly "quarterback-proof," and he already has five signal callers under contract (Bradford, Mark Sanchez, Matt Barkley, Tebow and G.J. Kinne), although admittedly none of them project any better than the guy who went 14-4 for him as a starter but was given up on (Foles). Quite possibly the only tangible thing we have learned about Kelly to this point is that no matter what he says in front of a microphone, the slavish devotion to his system defines him. And that is perhaps the ultimate sin in a league wholly dependent on talent. Understand as great as Bill Belichick is, he wasn't about to win Super Bowls in Cleveland with a descending Bernie Kosar, Mike Tomczak or Vinny Testaverde playing quarterback. However, a Belichick-coached team almost always ends with a result far greater than the sum of its parts. To be fair to Kelly, it's not like Belichick, or any other mentor, doesn't have an idea on how he wants things to go on any given Sunday, but the great coaches understand what the NFL is about and come to grips with the reality that you are never going to be able to acquire every player you want. It's about making what you have better, not finding the round pegs to fit snugly in the 22 holes available. It's too early to say Kelly and his Eagles are adrift and heading toward the rocks, but the "Chip Ship" is, at bare minimum, rudderless with the engine- room sirens blaring. There's always a chance I'm wrong and Kelly is the football genius his acolytes will have you believe. The more likely result, though, is that this emperor has no clothes. 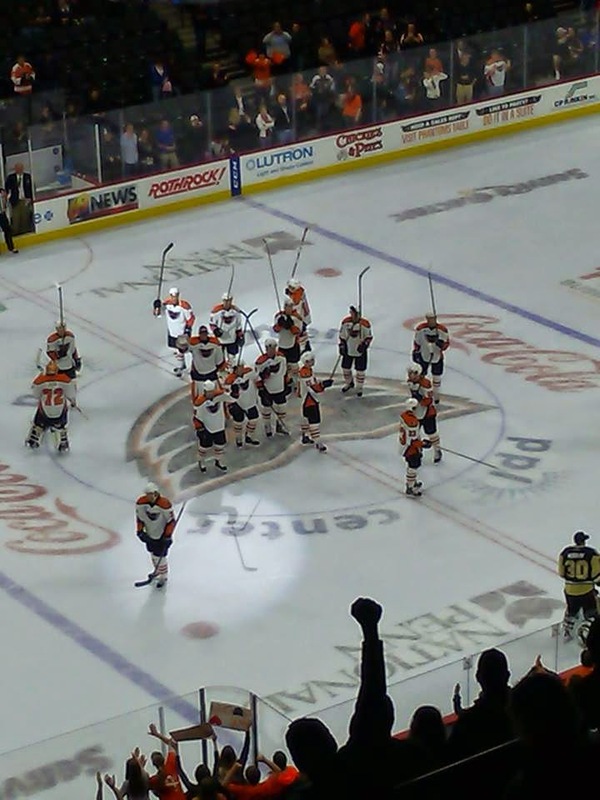 Allentown, PA -- Year One of the Phantoms experiment in the Lehigh Valley is complete, and, like the five which preceded up in Glens Falls, ended on the final day of the regular season. With nothing else to play for but pride, in front of a crowd clearly half of the announced 8,689, they turned in the usual performance in a 5-1 loss to the playoff-bound Wilkes-Barre/Scranton Baby Pens on Sunday evening. Sean Escobedo recorded a goal and two assists for the Penguins (45-24-7), the second-place club in the East Division who will be moving onto the playoffs to take on Syracuse. Jean-Sebastien Dea, Tom Kuhnhackl, Bobby Farnham and Jayson Megna also tallied while Jeff Zatkoff was good on 32-of-33 shots to end his season with 18 wins and three shutouts. Oliver Lauridsen recorded the lone marker for the Phantoms (33-35-8), who ended up fourth in the East and third-to-last in the conference. Even with the long-term call-up of Scott Laughton and the look Nick Cousins got in the last few weeks in Philadelphia, they finished the season scoring two goals or fewer in 41 of 76 outings. Rob Zepp surrendered all five goals on 35 shots for the hosts, who completed the year on a 2-6-1 tear which included a pair of three-game win streaks. That didn't prevent head coach Terry Murray from a positive spin on this first year in a new location: "I would call it a success," he said when pressed on the development aspect. "When you look at the goal of teams at this level is to make sure players are ready to play in the NHL, we've done that." Already down by two, Brett Hextall began the third period in the penalty box and his teammates couldn't prevent another power-play goal, as Carter Rowney found some space in close to slip a pass across for a successful redirection by Escobedo less than 90 seconds in for a 4-1 game. Megna's shot just under the crossbar for his team-best 26th goal of the campaign sent most of the paying customers to the exits at 5-1 with a hair under 11 minutes left in the contest. The evening's nonsense competition kicked in from there, with two separate line scrums standing in a as the final calling cards this season. For starters, both Zack Stortini and Alex Boak were given the gate after fisticuffs erupted with 8:25 on the clock. To conclude, Hextall, Farnham and Dominik Uher were sent packing with 5.6 seconds showing in the wake of more pushing and shoving. All of that led to the Phantoms finishing atop one AHL list -- total penalty minutes -- with 1,834. Stortini ended up with a misconduct, giving him 184 penalty minutes on the year, good enough for second on the club. Jay Rosehill remained atop the list at 219 PIM. One player who is looking ahead is defenseman Brandon Manning, who finished tops among team defensemen in goals (11), assists (32) and points (43). "I'm just going to keep training. Every summer coming up is your biggest Summer. The plan is to make the Flyers, that's my goal for next season," Manning admitted. "I'm going to try and get a little bit stronger and a little bit quicker. come into camp ready and pick up a spot there." The most penalized team in the American Hockey League, and one which provided their foes with 122 power-play chances in 11 previous meetings, promptly gave up two infractions in a 22-second span early in the contest. The Baby Pens had 1:38 of 5-on-3 to work with, and after a timeout mid-advantage, clicked with 23 seconds left on the two-man edge when Dea beat Zepp from the left side at 3:20. Though the Phantoms killed off the remaining 5-on-4, the hosts fell behind by two as Kuhnhackl won a battle on the right-wing boards, cut towards the net and beat Zepp high to the glove side from the inner arc of the circle at 4:09. Farnham decided to stir things up inside of a minute left in the first period, lining up Rosehill for a hit along the benches. Those plans were foiled when the latter caught on and dumped the former into his own bench, drawing a crowd and also giving the Baby Pens yet another power play. Lehigh Valley killed off that carryover situation, but Farnham got his revenge as well as some groans from the crowd when he scored on a backhander to make it 3-0 less than three minutes into the second period. Lauridsen put the Phantoms on the board at the 9:27 mark, on a move reminiscent of Michael Del Zotto. He rushed up the left wing, cut in at the top of the circle and put a low shot on net which squeaked through Zatkoff, who didn't secure 100 percent of his padding. "For the most part I'm pretty happy with the way I finished up the season. You can't really take anything for granted here, so just have to see how your meetings go and take the off-season one day at a time," Lauridsen said. The large Dane is off to represent his native Denmark in the Worlds which take place next month. Notes: Escobedo, a Boston University graduate, also suited up for Hartford in the AHL and spent the majority of the year playing with Greenville of the ECHL totaling 19 points (3G, 16A) in 61 appearances ... Lehigh Valley finished its season series with WBS at 5-6-1 and completed its home slate at 17-15-6 ... The Phantoms averaged 8,163 fans and placed fourth in the AHL, totaling 310,199 for all 38 home dates in their new locale ...Phantoms assistant captain Andrew Gordon left the game in the first period and did not return due to a knee injury ... The Bridgeport Sound Tigers ended up second in the league at 1,726 PIMs ... Former Flyers and Phantoms product, defenseman Danny Syvret, ended up with an assist and a minus-1 with two shots on goal. The inevitable took less than 48 hours to become reality. In the time between Ron Hextall's perfunctory season-ending press conference on Wednesday afternoon and Friday morning, the decision was made public that Craig Berube would not continue as head coach of the Philadelphia Flyers. The 49-year-old former enforcer, six-year Flyers assistant and two-time Phantoms head coach was brought up to the majors on October 7, 2013, an emergency elevation after Peter Laviolette's 0-3-0 start to the 2013-14 season was deemed alarming enough for a change to be made. A playoff berth gained last season wasn't enough to carry over to this past season, where the club set a new team record for games played beyond regulation but failed to climb higher than sixth in the Metropolitan Division. He leaves his former position with a "winning record" of 75-58-28 along with a 3-4 postseason mark. "Well, nothing changed. It’s just a process that I went through. I wanted to make the right decision, Hextall admitted when pressed on any factors which changed his mind between the pressers. "Once I kind of put all the facts together, and in the end you go with your gut, and I came up with the decision last night. You really have to decide, is the coach is the right coach for your team now. If the answer to that is no, you need to move on. Under Berube, the raw stats, namely road record, are particularly damning. Their 10 victories in alternate environs tied for the fourth-worst in a full season in franchise history, matching a playoff team from 1972-73 and a non-playoff entrant in 1991-92. However, a bigger issue was in-game management, namely line-shuffling and putting players in the best position to succeed. Though it's been widely reported that any lineup decisions were subject to approval higher up the chain, it's the head coach's responsibility to maximize the output of the roster given, in sickness and in health. Hextall confirmed that with the following: "In a nutshell, in the end I didn’t feel like he got enough out of our group collectively." There's not much of an argument that mistakes were made on a routine basis -- his most significant gaffe being the handling of goaltender Steve Mason when he was injured or faltered in net -- which forced Jeff Reese to abandon his post weeks before the schedule was complete. The most egregious error pointed out consistently was the usage and philosophy regarding Sean Couturier, a defensive center with scoring touch who was buried a majority of his ice time inside his own zone and expected -- by both Berube and Hextall -- to produce in spite of that. You can also point to usage of defensemen, and the mysterious gaps in dressing for those like Michael Del Zotto and Carlo Colaiacovo when Nicklas Grossmann, Andrew MacDonald and Luke Schenn maintained their spots in the rotation despite egregious errors. Also lingering in the air was the chicken-egg argument with Vinny Lecavalier, chronically unable to produce given a small window of opportunity and buried on the fourth line most nights in the second season of a five-year mega-contract. And then, the big sticking point which has less concrete evidence but tons of "feel" to it: Berube's lack of hockey IQ, an issue brought to the forefront here earlier in the season. I've covered four separate Flyers head coaches since first gaining NHL-level credentials in 2005. Each one in succession seemed to be less available than the man previously, less willing to tip his hand and using words at a higher premium. From the expansive Ken Hitchcock to the barely verbal Berube, it was quite a difference. Press conference after press conference, home or away, win or loss, Berube's most expressive insights to the Flyers' success and failures revolved around simple coded phrases "compete level," and "working harder." Those basic thoughts were a successful formula to keep a kid from Alberta in the NHL for 18 years and it worked to a point in the AHL at a level where young players need to demonstrate they'll do anything to get a shot in the Show. Yet, despite six seasons as an assistant to John Stevens and Laviolette and garnering praise for operating the defense and the penalty kill as an assistant, when Berube was elevated to the top post, those basics on which he built his career became moot. Leading a franchise which views itself as top-shelf based on reputation demands a bench boss who can successfully adapt, learn and adequately explain himself, right or wrong. Berube fell well short, and appropriately paid the price. It was telling that, given a chance to praise any singular attribute which made Berube a success behind the bench, Hextall was purposefully elusive. Could Bob Clarke or Paul Holmgren have pulled the trigger when a tough decision needed to be made about a man loyal to the organization in both uniform and in a suit? That's a tough supposition, but we can at least praise Hextall for bucking tradition in trying to formulate his own vision despite relying on an old cliche. "I think in the end a coach’s job is to get the most out of his players, and in the end that’s the conclusion that I came to, was that that wasn’t the case," Hextall reaffirmed. "I will say this – Craig Berube is a good friend of mine, he’s a terrific man, and the professional side of this I have an obligation to the organization to do what I think is best, and that’s what I did." The lowdown on the coaching "carousel"
In the course of nearly 50 years as an NHL franchise, the Flyers front office has dipped into the well at either the minor-league level or at the right hand of the deposed head coach and hired a replacement from within on six occasions. It has been disastrous, or at the very least, unsuccessful, five times. The first occurrence was 1978, when Bob McCammon was tabbed to succeed Fred Shero. McCammon had won a Calder Cup as a first-year bench boss for the club's first-year AHL affiliate, the Maine Mariners. With no other high-profile names willing to take the plunge, he was tabbed to preside over a team which reached the Stanley Cup semifinals the year prior. Only 22 wins and 50 games in, Ed Snider and Keith Allen pulled the plug over what they felt was an "excitable" rookie coach. Their chosen replacement? The man who was selected to take over for McCammon in Portland, former NHL defenseman Pat Quinn. Quinn guided the Flyers through the loss of Bernie Parent and the Streak of 1979-80, lasting until March of 1982 before his firing brought back McCammon from Maine once more. McCammon was deposed a second time despite 97 wins, hamstrung by his lack of playoff success (1-9 in three years) and a desire by those higher than he to separate the coach and GM positions. Flash forward to six years later, when Mike Keenan's act wore thin after four unexpectedly grand seasons. His replacement, in the bad cop-good cop mold, was three-year assistant Holmgren. Benefitting from a lighter hand than his predecessor and a seasoned roster which reached two Stanley Cup Finals, "Homer" led the Orange and Black to a Wales Conference Finals berth in '89, but caught the short end of a rebuild and was eventually booed out of town by December of '91 in the midst of a prolonged winless streak after two straight years out of the playoffs. Stevens won a Calder Cup with a loaded Phantoms roster in 2005 while the NHL laid dormant, and that was his ticket up when Clarke shifted his roster from veteran-laden to youth-oriented once the league returned. Ken Hitchcock's abrasive style gave way to Stevens' calmer traits, but despite a surprise Eastern finals run in '08, the eventual 2009-10 Cup Finals entrant was moved to somnambulance by Stevens' lack of on-ice creativity when a move was made that December. 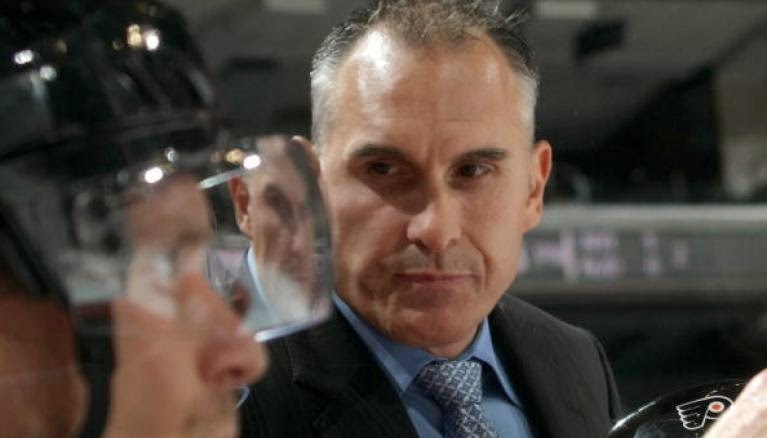 And now, we'll count Berube on the list of loyal workers forced to fall on the sword and facing an uncertain future. Hextall has been essentially forced to look outside the box for the best available candidate. That's consistent with the ebb and flow of all coaching decisions, no matter what sport. One man with a particular personality and system fails, the opposite is sought as counter-balance. "We’ll do our homework in the next couple weeks and see who the candidates are, and start the interview process and go from there. In the end, you’re looking for the coach that fits your team, obviously [that] thinks the same way to some degree," Hextall offered. "In the end we’re looking for the guy who can take this group to another level not only short term, but long term." That's key, since Berube was apparently on a short leash. He was a transitional choice in that the club was caught short canning Laviolette so early last season, but the Flyers must make their next hire a man who has a wealth of experience and has coached at the NHL level for extended periods of time. "I think as an NHL coach you have to have the ability to do both -- get the most out of your veterans, and intersect your young players into the lineup," Hextall presented as the best option. "Obviously with some of the prospects we have coming, part of the thought process in the new coach is can he get the most out of young players, and is he open to putting young players in the lineup." In Los Angeles, Hextall was able to see how that worked to varying results. From the abrasive Marc Crawford to the cooler head of current Phantoms head coach Terry Murray to things finally clicking with Darryl Sutter, it was a four-year process. There is a rare breed of coach who can influence the general manager to make the right moves to mold a team from playoff threat to legitimate contender. A prime example in a one-shot deal was Keenan in New York circa 1993-94, who was able to belittle the players he wanted gone in the Rangers' locker room and impress upon GM Neil Smith whom he wanted to fill those gaps. In the long run, Scotty Bowman was able to mold rosters in both Pittsburgh and Detroit, with the implicit trust of Craig Patrick, Jim Devellano and Ken Holland that his influence was correct. Bowman proved sage enough to rid himself of Paul Coffey not once, but twice, to help his teams win Stanley Cups. It remains to be seen whether or not a Todd MacLellan or Mike Babcock, Dan Bylsma or whomever else Hextall deems fit will have enough of a strong personality and proper bona fides to push for the kind of players the Flyers need to acquire. Berube was clearly a "go along to get along" type of leader. It also remains to be seen if the chain of command is willing to accept bucking their own internal decision-making system to do what is right when the next head coach gets the itch. Even above experience, a mutual sense of trust is the best bridge that can be built towards success. Philadelphia, PA -- Michael Beasley scored a season-high 34 points with 11 rebounds and eight assists as the Miami Heat ended their season with a 105-101 win over the Philadelphia 76ers on Wednesday. Zoran Dragic netted a career-high 22 points, Henry Walker scored 21 and James Ennis finished with 17 points, 12 boards and six assists for the Heat (37-45), who won despite resting the majority of their starters including Goran Dragic and Dwyane Wade. "It's been a tough three weeks," Heat head coach Erik Spoelstra said. "At least we can leave the last game with integrity and competitive character." JaKarr Sampson totaled a career-high 22 points, while Robert Covington and Hollis Thompson each had 19 points for the 76ers (18-64), who matched their worst mark since the 1995-96 season. The 76ers cut into their 18-point halftime deficit with 10 straight points to start the third quarter. They outscored the Heat 25-11 during the frame and netted the final five points of the quarter to get within 75-71 heading into the final stanza. Thomas Robinson scored four straight points and Jerami Grant gave the Sixers a lead with a dunk with under seven minutes to play. Dragic, however, scored six straight points and the Heat made it a 94-88 game with 4:17 to play. Grant hit a jumper and following a pair of Covington free throws, Sampson's putback slam of Grant's miss tied the game with 3:05 left. After Beasley scored six straight points, the Sixers responded with a 7-0 spurt that was capped on Sampson's dunk for a 101-100 lead with 23.7 ticks on the clock. Walker, however, sealed the win by knocking down a 3 and Tyler Johnson's driving dunk following Covington's miss from beyond the arc accounted for the final score. "They made a run in the fourth quarter," Robinson said. "We didn't have enough time to come back." The Heat, who will miss the playoffs for the first time since the 2008 season, scored nine of the final 13 points to lead 29-23 after the opening 12 minutes of play. Thompson hit back-to-back 3s to tie the game two minutes into the second quarter, but Miami quickly regained its advantage with a 16-6 spurt that contained contributions from beyond the arc from Walker, Dragic and Ennis. Miami continued to pour it on and led 64-46 at halftime. 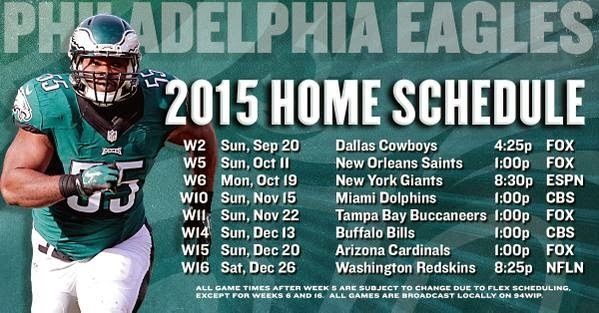 Notes: Philadelphia lost its final 10 games of the season ... 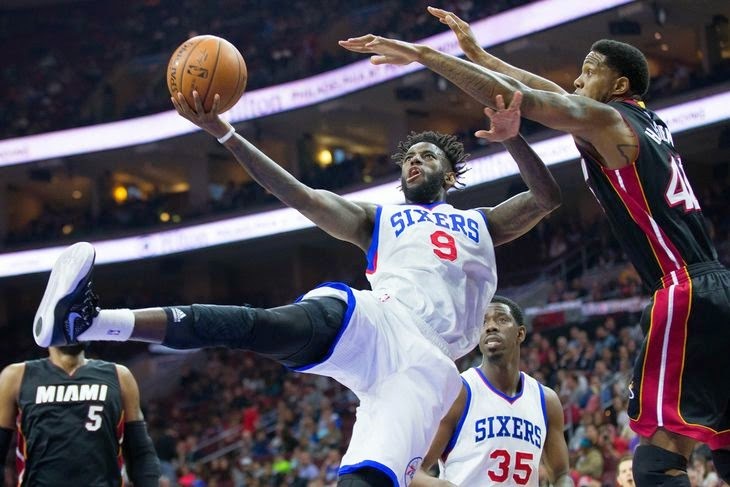 The Sixers outscored the Heat in the paint by a 58-46 margin ... Miami led by as many as 20 points. Why is Craig Berube still employed? It's the Million Dollar Question when two other NHL teams badly in need of a change in direction don't even wait 24 hours from the end of the regular season to fire their head coaches, and your team stands pat, four days and counting. Berube may or may not have an immediate future with the Philadelphia Flyers -- as a head coach or in some other, lesser capacity. Whatever the path the team's front office takes regarding this 49-year-old good soldier, it's not going to be made on a whim and it won't be made until all the facts are considered. 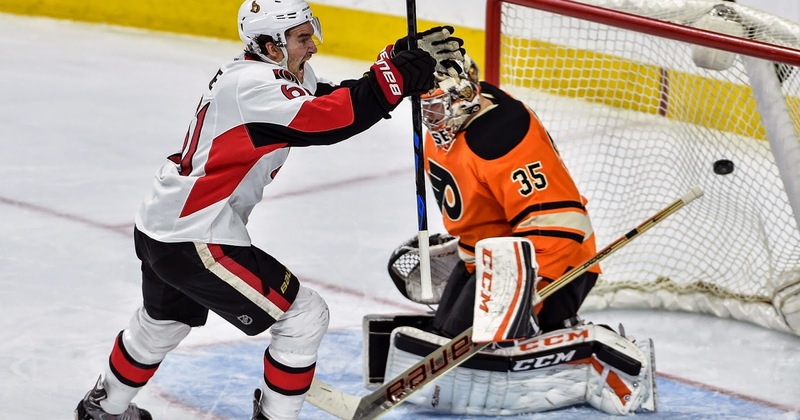 Saturday was the Flyers' home and season finale, a 3-1 loss to Ottawa which put the Senators into the playoffs. Sunday was a day to rest after a grueling 82 game course with all the precipitous twists, turns, rises and drops of Kingda Ka. Monday was the day for the players to collect their belongings, to undergo their exit interviews, and for certain non-playing personnel to give their closing remarks as well as undergo their own exit interviews. Tuesday, while there was a loaded back page in the Daily News decrying the organization's supposed sloth-like maneuvering along with the requisite viral complaints from social media, was likely the day when the coaching staff will have their say. Today, before a big announcement is made in a couple hours, is the a day where Ron Hextall and Paul Holmgren began huddled in seclusion in the West Wing armed with a map of the hockey world and the collected opinions of those who directly worked under Berube to consider. "[T]he rest of the coaching world hasn't been completely shaken up yet. There's no rush right now. Toronto fired journeyman interim coach Peter Horachek. Buffalo canned Ted Nolan. They are not Flyers candidates. "Tough decisions loom in San Jose, Boston, Arizona, Edmonton and even Los Angeles after a report that Darryl Sutter was locked out of the locker room by his team after a loss. Heads could roll in Pittsburgh, Montreal, St. Louis and even Anaheim if quick first-round exits result." Time is of the essence, but it should not be wasted nor should it be consumed by immediate reaction based on irrational thoughts. If Hextall wants to preach patience in development and practice what he preaches, why should anyone question that he'd want to fulfill that promise regarding the single most important on-ice position? Potential candidates from the NHL will become available as soon as two weeks from today, men who have put together careers behind the bench longer and more distinguished than Berube's 161-game baptism of fire. Unfortunately, Seravalli contradicts himself one paragraph later, stating: "It seems like cruel and unusual punishment for Hextall to keep Berube without some sort of vote of confidence by now." And Bill Meltzer also falls on the side of sympathy for the men in charge when he wrote: "Hextall planned to meet with Berube after talking with all the players and gave no hint of a timetable to make decisions. That is understandable, but it is unfair to Berube and the assistant coaches to keep them in limbo while waiting to see who else may become available." If a decision like firing a head coach is not to be taken lightly -- especially given the fact that Ed Snider, Bob Clarke and Paul Holmgren have bristled for years every single time a coaching change has made and the modifiers "instability" or "carousel" routinely fall from reporters' or beats' lips -- and Berube has worked his way through the organization long enough to know how the front office works, then he knows how to remain cool until the signal is given one way or another. The same might be said for Ian Laperriere and to a lesser extent, new addition Gord Murphy who has worked his way through the NHL as an assistant. A final decision may not be announced today but Hextall won't keep these guys on the tether so long they can't pursue other opportunities both inside and outside the club if that's the best foot forward. No one really needs to advocate on their behalf and I'll bet my meager gains from writing that Berube is the person least concerned of all concerned parties. If the decision to keep or chuck a head coach is anything like signing off on certain roster moves which have caused a spate of nuclear reactions from all sides this season, then there's no reason to believe it's going to be done quickly or easily. Or most importantly, to the tastes of any outside observers -- and Hextall said that almost to the letter in his opening remarks. There's relatively little pressure for a move to be made in the offseason, with no continuation of a schedule to take into consideration as it was when Berube was elevated to the position once Peter Laviolette was suddenly deemed too deficient two Octobers back. Besides, any new bench boss is best served getting to know the team as constituted, once the draft and free agency have passed and any available deals to reshape the roster or alleviate the cap situation have been consummated. That won't happen until mid-July at the earliest, with a whole two months grace before training camp. Even if Berube is given the Spanish Archer, let's not start the drumbeat of "when is Hextall going to hire someone" for a while, OK? 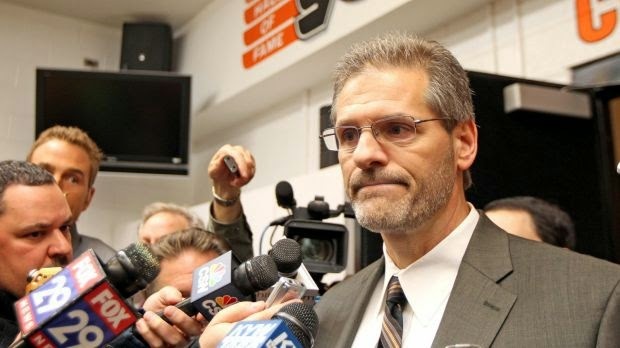 Why should Hextall provide a smoke screen just to mollify speculation from a columnist? Why should he, either publicly or privately, offer lip-service support when that can turn at the drop of a puck and the best available person falls on the club's collective lap? It would be tantamount to Jeff Carter's agent being assured Carter wouldn't be traded four years back, then voila! a deal was suddenly in the works with Columbus. You simply don't do the dirt like that to an employee who was part of the brotherhood, and Hextall knows this as an ex-player and long-time administrator. Lack of support or a strong comment so quickly after a season completes cannot be taken as a sign of malfeasance. Thought and diligence can't be mistaken as weakness. So let's end with the Hundred Dollar Question: why is anyone complaining if Berube is still here? Look in the mirror. If the reflection staring back is anyone other than Hextall himself, no need to wonder or whine on a daily basis. You're not in control. It's much better that way. Chester, Pa. – John McCarthy may not have Rais Mbolhi's resume but the new Philadelphia goalkeeper now has something the deposed former World Cup netminder doesn't, a 2015 win as the Union's starter. The Union edged New York City FC 2-1 Saturday when Vincent Nogueira deposited the game-winner during the second minute of stoppage time in front of a capacity crowd of 18,603 at PPL Park. It was the first win of the season for the Union as 20-year-old Zach Pfeffe notched his second career goal as a complement to Nogueira's late-match heroics. It was also the MLS debut for McCarthy, who took over the club after the organization decided the much-hyped Mbolhi was not a fit. The La Salle product made three saves. "For the night the city will be his," Union head coach Jim Curtin said of McCarthy. "He’ll have a good time but you’ll have to move on and start to think about Thursday (for the rematch against NYC FC) . It was a solid performance from him. It kicked well into a tough win in the first half. He made the saves when we needed him to." As for Mbolhi, he's future remains in flux but its unlikely to be in Chester despite a denial from Curtain. "Rais is still a Philadelphia Union player," Curtain said. "He’s a guy that is taking some time away from the team right now clearing his head and when he comes back we all know what he’s capable of. He’s a goalkeeper who has been noted at the highest level for a long time. Rais and I will have a discussion and when it’s time for him to come back he will come back." The Union first broke through in the 27th minute when a long run from Andrew Wenger set up Sebastien Le Toux on the left flank. The Frenchman beat a defender near the end line and centered a ball that appeared to go in off Eric Ayuk Mbu, who was originally credited with the marker. It was later changed to Pfeffer who touched it last. The 1-0 Union advantage was a precarious one which was erased when David Villa equalized things in the 55th minute after a scramble inside the Union box. Wenger, McCarthy and Josh Williams all converged on a ball that got loose for Villa. Nogueira won it on stoppage time, pouncing on the ball from about 12 yards out and slicing it past NYC FC GK Josh Saunders. With the win, the Union moved to 1-3-2 (5 points) on the season while the setback drops NYC FC to 1-2-2 (5 points). The two teams will finish off the home-and-home set on Thursday at Yankee Stadium.